In this Aug. 28, 2016 file photo, Kanye West, left, and Kim Kardashian West arrive at the MTV Video Music Awards in New York. Per the LAPD, a witness saw one suspect enter and exit a vehicle before fleeing while a second suspect, who was hiding in some bushes, also fled. The LAPD confirmed the first suspect took personal items from the car. 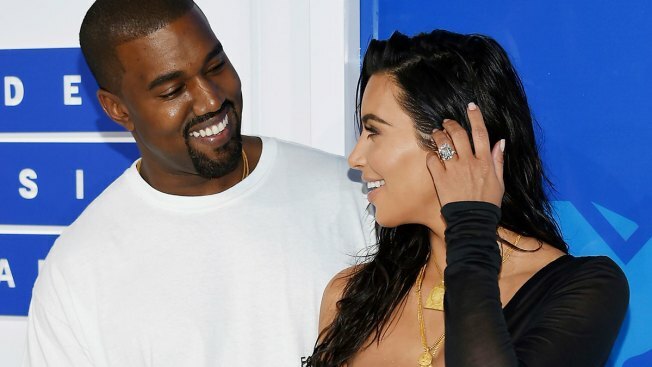 There was a gold digger on Kim Kardashian West and Kanye West's property but the thief could only get as far as their car. Two suspects made their way to the A-list pair's Bel Air mansion early Friday, E! News can confirm. According to the Los Angeles Police Department, authorities were notified of a motor vehicle theft around 5 a.m. Per the LAPD, a witness saw one suspect enter and exit a vehicle before fleeing while a second suspect, who was hiding in some bushes, also fled. The LAPD confirmed the first suspect took personal items from the car. According to TMZ, which was first to report the news, one suspect made off with an iPhone, reportedly belonging to a staffer. With the theft called in, it appeared to be business as usual for the reality star mom of two as she took to Snapchat to document her workout at 6:45 a.m.
E! News has reached out to the pair's reps for further comment. Meanwhile, the Kardashian-Wests are far from the first stars to be hit by a burglary this year. Just a day earlier, Mariah Carey's Los Angeles mansion was the target of a burglary as thieves got away with $50,000 worth of handbags and sunglasses.